Hand-stained and carved with decorative flourishes, the Andover 18-inch W x 16-inch D x 65-inch H Linen Tower in Antique Black will look right at home in any traditionally-styled bathroom. Zero-emission solid oak wood construction ensures the Andover will look beautiful for years to come with minimal environmental impact. 2 doors and 1 drawer provide ample storage space to hide toiletries and extra towels. The Modero Linen Tower from Avanity stands tall with its simple, clean design in a chilled grey finish and contemporary brushed nickel hardware. Constructed of solid poplar wood and veneer for lasting use, it offers ample storage with a soft-close glass door, interior shelving and four drawers that showcase a blend of style and functionality. Store linens, bath essentials and more with this slim, space-saving design that maximizes your vertical space. Reflecting the subtle style of the Foremost Naples collection, this fully assembled floor cabinet boasts ample storage space in a convenient, compact design. Behind its craftsman-style door in a warm cinnamon finish is a handy shelf to keep bathroom accessories organized and out of the way. Big on style and storage, the cabinet also features a full-extension drawer for additional items. Reflecting the subtle style of the Foremost Naples collection, this tall, fully assembled linen cabinet boasts a wealth of storage possibilities. Behind its four craftsman-style doors in a warm cinnamon finish are three adjustable shelves for complete space customization. Big on style and storage, the cabinet offers a perfect solution for organizing towels, bedding, bathroom accessories and more, keeping your space clean and clutter-free. 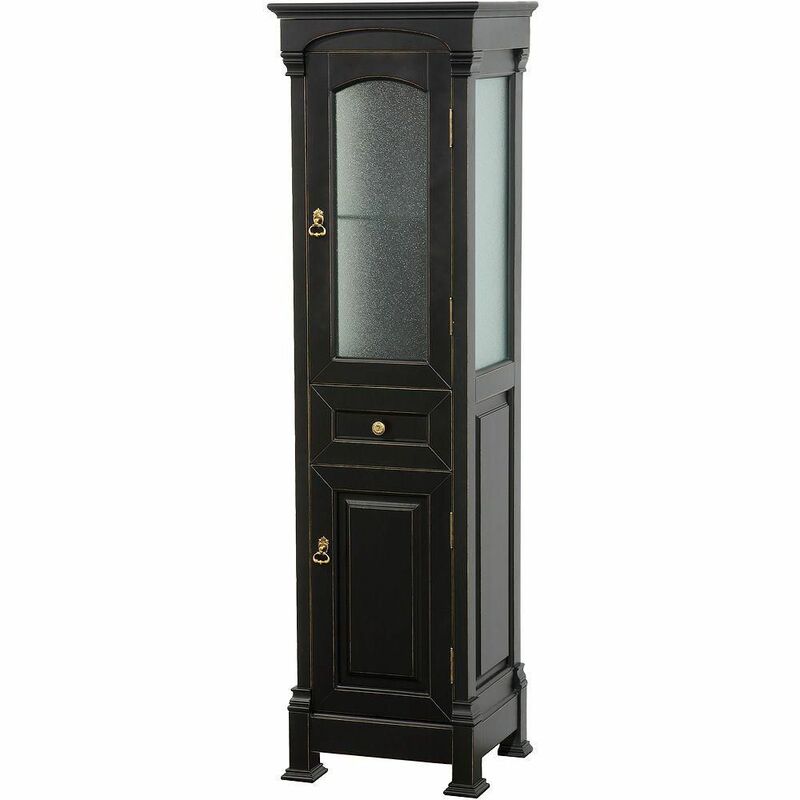 Andover 18-inch W x 16-inch D x 65-inch H Bathroom Linen Storage Tower Cabinet in Antique Black Hand-stained and carved with decorative flourishes, the Andover 18-inch W x 16-inch D x 65-inch H Linen Tower in Antique Black will look right at home in any traditionally-styled bathroom. Zero-emission solid oak wood construction ensures the Andover will look beautiful for years to come with minimal environmental impact. 2 doors and 1 drawer provide ample storage space to hide toiletries and extra towels. Andover 18-inch W x 16-inch D x 65-inch H Bathroom Linen Storage Tower Cabinet in Antique Black is rated 4.0 out of 5 by 1. Rated 4 out of 5 by PleasedInWasilla from We were pleased to find the product offered at a discount to what we originally saw as the price.... We were pleased to find the product offered at a discount to what we originally saw as the price. It meets our needs and expectations and it fits our location perfectly, as we planned. Home Depot has been great to work with and we appreciate being able to work with our local store to get products delivered to Alaska that we could never find as economically as shopping locally. The item weighed about a 150 lbs and was packaged in fairly heavy cardboard with the edges extra protected all the way around. This was clearly needed (and appreciated) as the package still suffered some holes and damages. The lower compartment door closes into place via a cheap magnet against pot metal. This item was broken when we first opened the cabinet. We currently have it cobbled together and will keep a close eye on it. It may need a more substantial repair. All-in-all we are very pleased and it is an attractive piece. It finished out our bathroom remodel and is a great place for the sundries and towels an active bathroom needs. One star off for issues mentioned.